Icelandic soils are quite special on a global scale. They are Andosols, soils that form in volcanic ejecta, but such soils are common within the volcanic regions on Earth. However, intense aeolian activity, the basaltic nature of the volcanic materials, intense cryoturbation, and the extensive sandy deserts set the Icelandic soil environments apart from other volcanic areas. Even the wetland soils are unique for Arctic soils: a blend of Andosols and organic soils of Arctic wetlands. A classification of Icelandic soils was presented by Arnalds and Oskarsson. A number of references of on Icelandic soils is provided. 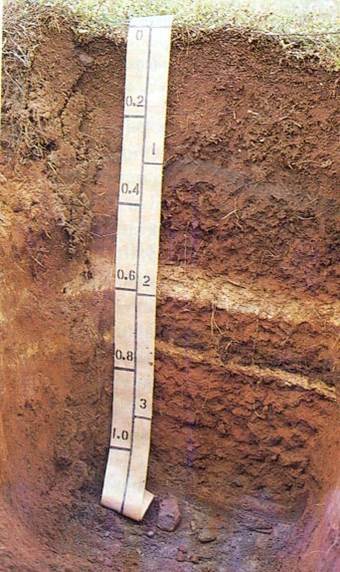 Andosols have unique soil properties; fertile soils with high water retention but lacking cohesion. They main colloidal constiuents are allophane and imogolite but ferrihydrite is also common in Iceland. The soils under vegetation often have distinct layers of volcanic ash (tephra), making the colourful, but the layers can also be used for dating. About 40% of Icelandic surfaces are poorly vegetated - deserts. These surfaces have a special soil type that is separated from other Andosols and are termed Vitrisols.